AN ILLUMINATING way to save money is the goal of Horsell CofE Junior School – but the pupils need YOUR help to achieve it. The junior school is in the running for a £12,000 grant from M&S Energy to replace its original old-fashioned fluorescent strip lighting with energy-efficient LED lights. But they need votes to make this happen. Placed in the London region and short-listed against six other projects – including a large North London secondary school in East Finchley – the junior school is appealing for the local community to get behind them in the race for the much-needed grant. Currently in second place, the school hopes that local support over the next couple of weeks can make all the difference before voting closes on Friday, 20 October. 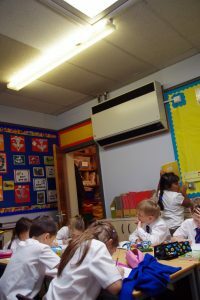 “LED lights are far more energy efficient and will save the school money at a time when school budgets are tight,” said head teacher Jessica Steele. “We would love to be able to install LED lighting in all our classrooms which will make annual savings to our energy bill as well as creating a better learning environment for the children,” she added. The new lighting would help the school to reduce its carbon footprint as well as save money. The pupils are already keen to help the environment, with “eco warriors” at the school making sure lights are turned off and doors closed when classrooms are empty. To help Horsell Junior School in their bid for the grant, visit the link to M&S community energy fund – www.mandsenergyfund.com/projects/horsell-junior-school-lets-save – and record your vote for this local project.